Spend the day exploring the Millstream-Chichester National Park with Clinton and learn the traditional stories about how the Warlu (Serpent) created Millstream during a time known as Ngurra-nyunjunggamu (when the world was soft). Millstream is an oasis in the desert complete with stunning pools and native palm trees. 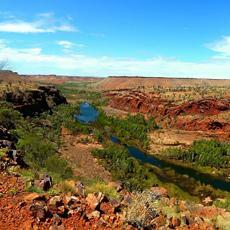 Millstream is the traditional home of the Yindjibarndi people and Yarndanyirra (Fortescue River).